Transfer guajillo chiles to a bowl, cover with 3 cups of water and cook in microwave for 10 minutes. Stir, cover and let steep for 10 minutes. Combine the green onions, 1/2 of the white onions, lime juice, and 1/2 teaspoon salt. Stir, set aside. In a bowl, combine the masa harina and 1 teaspoon salt. Gradually add in the warm water, mix until dough forms. Roll into 12 dough balls, transfer to a plate and cover with plastic wrap. Drain all the liquid from the guajillo peppers, transfer peppers to the blender; discard liquid. Add 1/2 of the diced onion, garlic, oregano, cumin, bouillon, 1/2 teaspoon salt, pepper, tomato sauce, and 3 1/2 cup of water. Blend on high until smooth. Taste for salt, set aside. Heat 4 tablespoons oil to medium heat for 2 minutes. Add 4 tablespoons flour and cook for 1 minute. Add sauce from the blender. Stir well to combine. Cook the sauce on medium low heat for 30 minutes. Keep warm. Preheat 2 cups oil to medium heat for 5 to 6 minutes. Line a tortilla press with plastic and press out dough balls two at a time. Fry the tortillas in hot oil for 30 to 40 seconds per side, drain onto plate lined with paper towels, cover to keep warm. Continue frying until all the tortillas are done. Dip one tortilla in warm sauce and transfer to plate. Add cheese and onion mixture. Repeat this process, making a stack of three tortillas per plate. Garnish with lettuce, tomato, avocado and cilantro. Discard the cooking liquid when rehydrating dried chile peppers because the liquid tends to be too bitter. 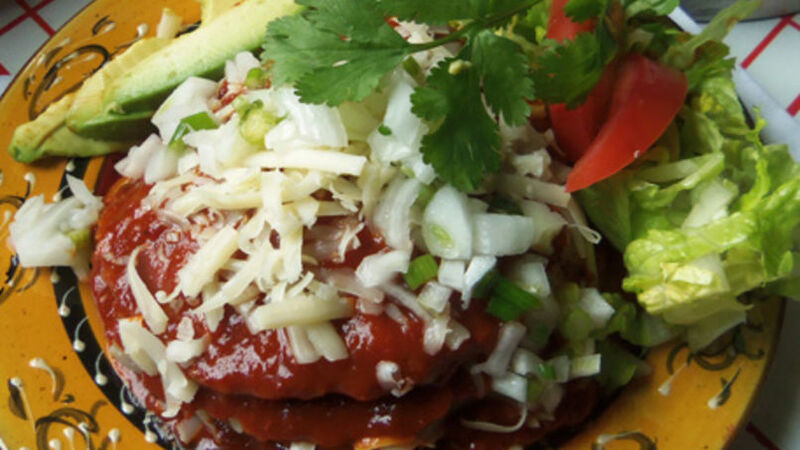 Stacked homemade tortillas, smothered in a chile guajillo sauce and simply filled with cheese and onions. This is a typical dish found in the smallest foods stalls to the more popular restaurants in Sonora, Mexico.